Music, Mormons and immaculate conceptions. What’s not to like? Electrick Children is about a sheltered Mormon girl with little to no knowledge of the world outside her family’s rustic compound. On her 15th birthday, she has her very first encounter with a cassette player and finds herself instantly smitten with the space-age gizmo. Unfortunately, cassette players also qualify as the devil’s work, so later that night while all are asleep, she sneaks into the basement and starts breaking some rules. She listens to a tape and is one with the music until she gets caught in the act and gets a slap on the wrist. A short time later, our girl finds out that she’s done got herself pregnant despite never having been with a man before. Her parents find out, and shockingly enough, they don’t believe her “knocked up by a cassette tape” story. Thinking quick, they decide to marry the girl off and banish her brother from the family to boot (you know, since they think he’s the baby’s father). But rather than go along with that horseshit plan, she and her brother carjack the family truck and book it to Las Vegas to find the “father” of her baby (aka: the lead singer from the band on the tape). As far as movie premises go, I can see some folks reading that last paragraph and thinking this all sounds a tad silly. Heartwarming? Possibly. Realistic? No. If that just so happens to be the case, then no worries, child, you can’t win ’em all. But as for me, this here premise is something inspired. I mean, anybody who’s ever dug any kind of music has gone through the same life-altering transformation that leaves our girl Rachel here a rock-and-roll virgin Mary. We’ve all heard that song, we all remember how our lives were unalterably changed from that day forward (or at least I do. Maybe it didn’t knock you up, maybe it didn’t lead to an arranged marriage with Cletus down the way, but as someone who can’t even remember what life was like before music entered into the picture, it’s awfully relatable and then some. But that’s not even the interesting part. Even it this had nothing to do with music, how great is that immaculate conception thing? Hell of a way to rope your audience in from the get go and keep them longing for answers. For Pete’s sake, it’s the physical manifestation of the moment a girl becomes a woman, and the notion that the father may or may not be a cassette tape only makes it that much better. It’s crazy, but as much as you’ll want to write it off as nonsense, you can’t, because you’ve been there. Awesome. But strangely enough, that’s not the most interesting part either. The interesting part is what comes next, or at least what I thought was coming next. By now, I’m guessing a number of you are already working out how this ditty plays out (ie: waiting on baited breath for the next hour until we finally discover the truth behind this “miracle baby”). And once these kids make their way to Sin City, I was thinking the same thing. And while much of the plot is driven by that very quest, it isn’t long before the whole baby daddy thing falls to the wayside and reveals this story’s true colors. As you may have caught on, this whole baby thing is ultimately a catalyst for something larger, something more universal than is initially let on. Before long, it becomes a story about growing up, letting go, and following the signs when life throws them your way, and it works. It works because few figures in history were more innocent than the Virgin Mary, and it works because few things in history have corrupted that innocence quite like music and everything that comes with it. And whether it’s from a religious standpoint, a musical standpoint or somewhere in between, it works on a number of levels to boot. It works because there’s no right way to approach Electrick Children and there’s a lot to take away from it, and it’s hard to imagine this story being told any other way. The thing is, I’ve seen movies like this, it just isn’t often that I get to watch movies like this. It’s a good-looking movie, don’t get me wrong, but I’m not talking about the visuals right now. The best way I can describe it is that Electrick Children is an experience you can groove to. You can dig as deep as you want, there’s no shortage of things to read into, but the more I watched, the more I found that I was going with the flow. It’s really nice, actually, and it just felt right. What can I say, writer/director Rebecca Thomas sets the mood like gangbusters here, and it makes me wish more film makers had such a free-flowing way about them. And despite all the Mormon banishment and teenage pregnancy going on here, the characters are refreshingly restrained. Sure, it’s not all flowers and sausages given the events at hand, but I feel like this could have turned into a Maury episode in the wrong hands. Instead, they use their inside voices when conflicts inevitably arise, they don’t really talk all that much to begin with, and that too does wonders in creating this easygoing tone I’m talking about. It’s a subtle picture that Thomas paints, and more importantly, it’s genuine. You care for these kids, you want to see how everything work out for them, and you hope it ends up in their favor. In a nutshell, it’s the kind of movie I simply enjoyed being around and spending time with because all the elements just seemed to complement each other. Hopefully that makes more sense on paper than it does in my head, but in the spirit of making sense, I’ll say this: Thomas knows what story she’s trying to tell and she knows the right way to tell it. This goes a long way, and it’s a compliment I wish I had the pleasure of handing out more often. And, man, what a perfectly catchy song for Rachel to fall in love with, even more so considering it was the first time I’d ever heard it, too. Been a good two weeks or so since I saw this movie, and I’m still listening to that thing on the daily. God, music is awesome. 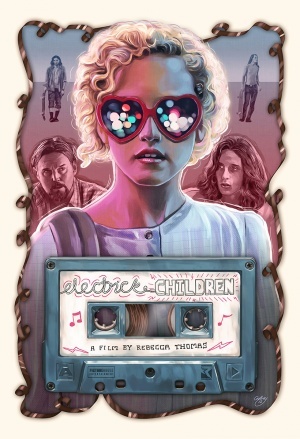 Electrick Children has been an interesting movie to write about, largely because it’s so unusual in both theory and practice. It’s a weird premise that gets executed in ways I wasn’t expecting, and while that might actually turn some folks off in the long run, I couldn’t help but I couldn’t help but dig it every step of the way. The cast is also good (bonus points for any movie that finds a place for Billy Zane), but it’s hard to play favorites with this number since the whole is equal to the sum of its parts. It’s one of them team efforts, I suppose. To tell you the truth, I’m still wondering whether I should get it over with and just give this an 8 already, ’cause by the time I put my Best Of list together next year, I wouldn’t be surprised if this one gets a well-deserved bump. Didn’t change my life or anything, but as far as life-changing stories go, this one was a keeper. I like the sound of this! Cheers. Her stepfather is the baby’s father silly.